Gyros are one of those novelty foods that I have really, really missed since going Paleo. I can still remember fondly all of the late nights at my favorite local gyro place. I really hadn’t even considered gyros as a possibility for me until I recently discovered this incredibly simple recipe for crepes/pitas/tortillas. I had tried Paleo baking so many times, and it was starting to seem impossible to enjoy any type of “carb”-like foods. Until now. So once I finally figured out how to create a worthwhile Paleo base for a gyro, I had to figure out the rest. Overall, this recipe is a bit involved because it has 3 parts; the wrap, the meat and the tzatziki sauce. But, each part is pretty simple and if you can spare a little time, these are totally worth it! I like to serve these with a side of homemade sweet potato fries for the full experience. I hope you love them! 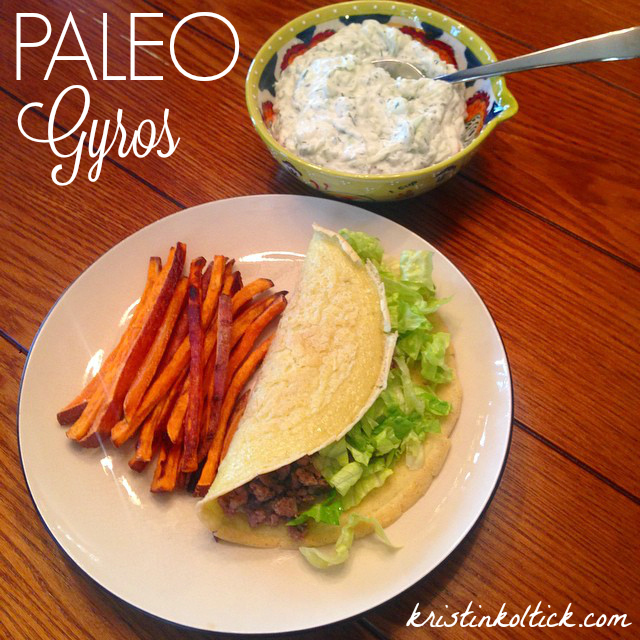 Paleo Gyro w/ Tzatziki Sauce. 1. Brown meat, onion and garlic in skillet over medium heat. 3. Add herbs and seasons. **If you prefer to make a loaf and bake, place raw mixture into oven and bake on 325 for 60-75 minutes. 1. Peel, seed and shred cucumber until you have roughly 1 cup. 3. Combine all ingredients in medium-sized bowl and mix well until thoroughly combined. I use this amazing Paleo Wrap Recipe for the wraps. Make sure to use 1/2 the mixture to make them a little thicker than a tortilla. They are a little spungier than a pita, but very light and delicious! **If you’re AIP and have tolerance issues with Arrowroot, you’re gonna want to use a different wrap than what I used. I recommend Paleo Wraps Gluten Free Coconut Wraps.